Rapier loom machine is a kind of shuttleless loom, which is a kind of loom which is more general and reliable than that of weaving medium and small batch. It is cheaper than other looms and is widely used. 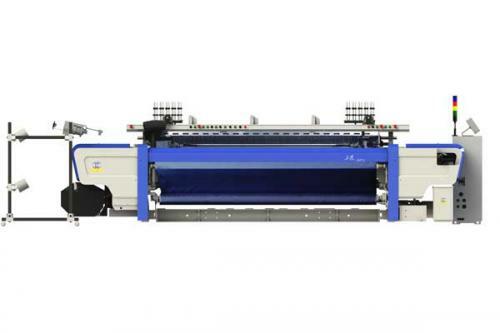 In the production process, the rapier loom speeds up the weft, which makes the rapier loom head and the rapier tape account for more than half of the total consumption of the machine? Therefore, how to effectively avoid rapier, rapier head of wear and prolong its service life, to save the production cost, improve product quality, enhance the market competitiveness of products have a vital role. The rapier head and the rapier tape are the key parts of the weft insertion task. In the weft insertion process of rapier loom, the weft yarn is always controlled by the head of the rapier, making the insertion error less and the reliability higher. Once the blade is worn down, it will cause the insertion failure, which can cause a large breakage of the warp thread and affect the quality of the cloth. The production practice found that most of the damage was caused by the breakage of the head of the weft and the blade of the weft. This situation is caused by the gap between the transmission and the long wear of the rapier. The wear of rapier looms has a lot to do with the variety of the weaving, different varieties have different wear and tear on the rapier head, and the difference is greater. The yarn number coarse, the fabric with dense density, the rapier head wear more serious, the service life is short. And chemical fiber products rapier head shorter service life, this is because the rapier head reciprocating friction heat on polyester warp, static electricity, the rapier head setting a indurations layer at the bottom of the material, easy to hang up the warp. The slurry used in warp sizing also has a great influence on the wear degree of the rapier head, and different slurry components have different effects on the wear of the head of the rapier. The craft structure of rapier loom machine has a certain relationship with the wear of the rapier head, especially the higher the height of the back beam and the greater the tension of the bottom warp, the more the wear of the rapier head is. (1) The degree of closeness of rapier insertion motion and warp opening movement in time is directly affecting the wear of the rapier head. The opening time of the warp yarn is too early, with less contact between the head of the weft and the warp yarn, and the contact between the blade and the warp yarn is more. Therefore, the blade is more squeezed with the warp friction. In the same way, the time lag of the opening of the warp thread, it will be less contact with the back and the warp, but the weft rapier head and the warp thread have more contact, so the blade of the rapier and the warp thread can squeeze more. Therefore, it is necessary to strictly control the opening time, so as to reduce the friction between the end of the blade and the warp thread and reduce the wear of the rapier head. (2) Selecting the slurry used in the sizing of the warp yarn should choose the chemical slurry to reduce the abrasion of the slurry to the rapier head so as to extend the life of the rapier head greatly. (3) In the process structure of the loom, the rear beam height is small, and the wear of the rapier head is small. But it is worth noting that the back rest appropriately raise is beneficial to improve the quality of cloth, cloth grain clarity, peak valley grain depth is much better than the back rest in 1000 mm, so shall determine a reasonable height of back rest. The height of the back beam is usually about 1040 mm when the fabric is high and high, so that the weaving can be carried out smoothly. (4) Further study the coating technology of the rapier head and enhance the wear resistance of the surface of the rapier. The wear resistance of the blade is very important for the service life of the rapier head. When the blade of the rapier is at high speed in and out of the warp shed, the warp yarn produces alternating pressure on the surface of the rapier, which causes fatigue and wear and peeling of the coating. While peeling clastic become large grinding grain hardness, under the effect of the warp of rapier head form of abrasive wear, over time, forms a height difference between coating and matrix and appear edge, lead to warp cut down. The higher the wear resistance, the longer the life of the blade. (5) From rapier, transmission between the rapier wheel wear, technicians in most of the time change the course of rapier loom rapier tape movement measures, to improve the rapier meshing between the tape and the rapier wheel wear. The change of curvature and the degree of flexure directly affect the fatigue damage degree of the rapier. The more change points, the more serious the damage. The weight of the rapier wheel and the blade of the rapier loom increases with the amount of the meshing length of the rapier weaving machine. The average force of the rapier tape and the rapier wheel meshing is reduced, which is beneficial to improve the service life of the rapier tape and the rapier wheel.